We’ve all seen RF Skin Rejuvenation procedures offered at the dermatologist. But wouldn’t you like to have the amazing skin smoothing and tightening effects of a Radio Frequency skin treatment at home? That’s why we love the DEESS Home RF Skin Rejuvenator. WHAT IS RF SKIN REJUVENATION? Radio Frequency Skin Rejuvenation is a technique where Radio Frequency Energy to heat the tissue underneath the top layers of skin. This makes the skin activate the process that produces collagen and elastin. This, in turn, lifts and tightens skin. It is considered as a non-invasive alternative to a Face Lift, Eye Lift, Brow Lift, or Throat Lift. The device fits easily in the hand, and the controls are very easy to use. The instruction manual covers any questions you may have about use. It is important to use a quality conduction gel with this product, which you can purchase from Amazon. 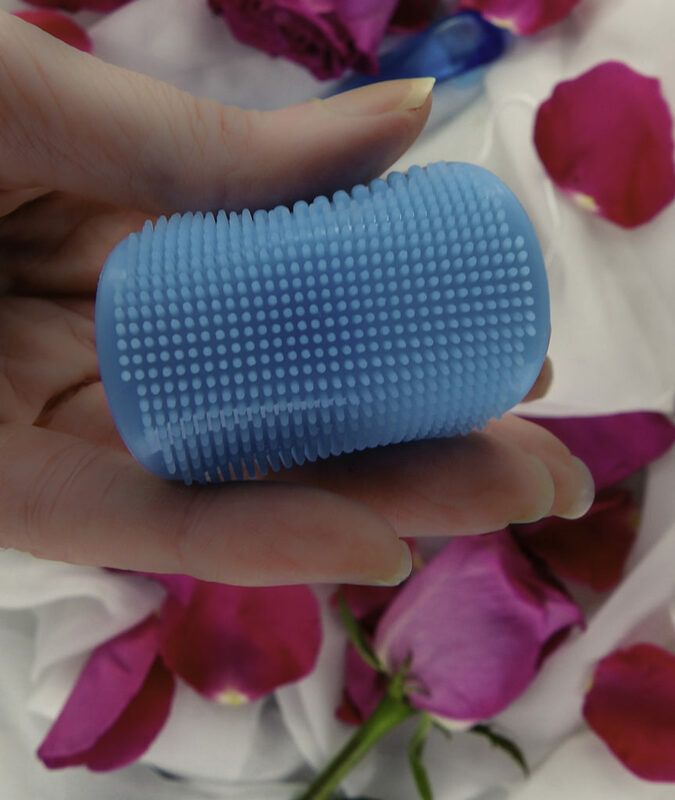 The conduction gel allows the probes on the device to form a “bond” to your skin and let the Radio Frequency waves pass directly to your skin without losing energy. It also lets the device move smoothly across your skin. Once you have applied the conduction gel, select the mode you want to use. Always go from the middle of your face outward and upward. It is warm, but it wasn’t at all uncomfortable or painful. 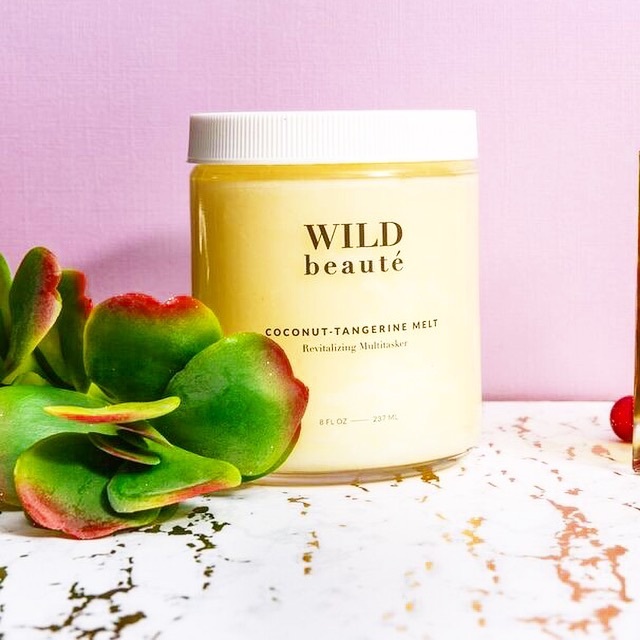 It’s an easy addition to your daily skincare routine! I am pleased with the results I’ve had so far with the DEESS Home RF Skin Rejuvenator. My skin seems tighter, especially around my jawline. The skin on my cheeks also appears more lifted and youthful. It is much less expensive than a single medi-spa treatment and I love that I can do it at home! 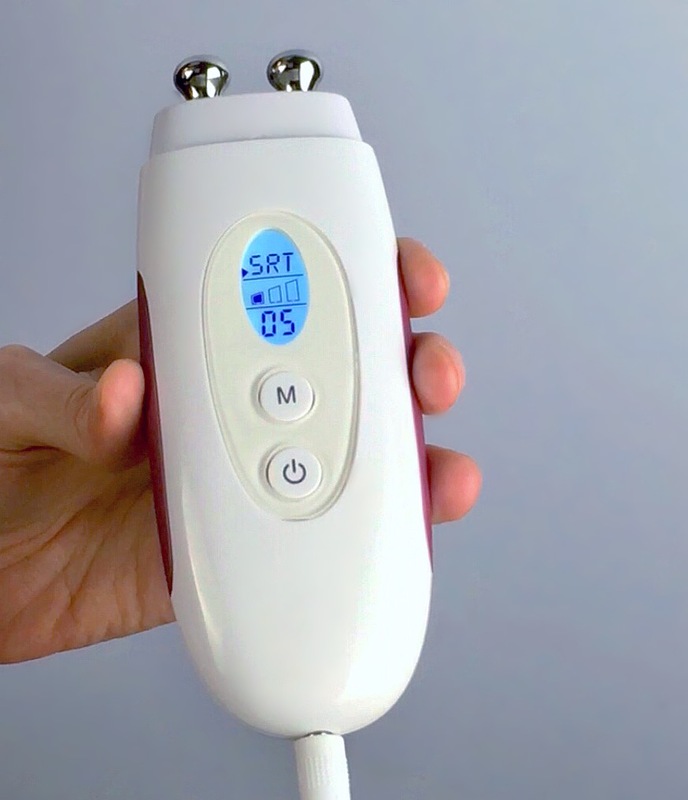 Find the DEESS Home RF Skin Rejuvenator at Find the DEESS Home RF Skin Rejuvenator at https://amzn.to/2H6B2KA and get 10% off with code WKZTA5JM through April 30th, 2018. 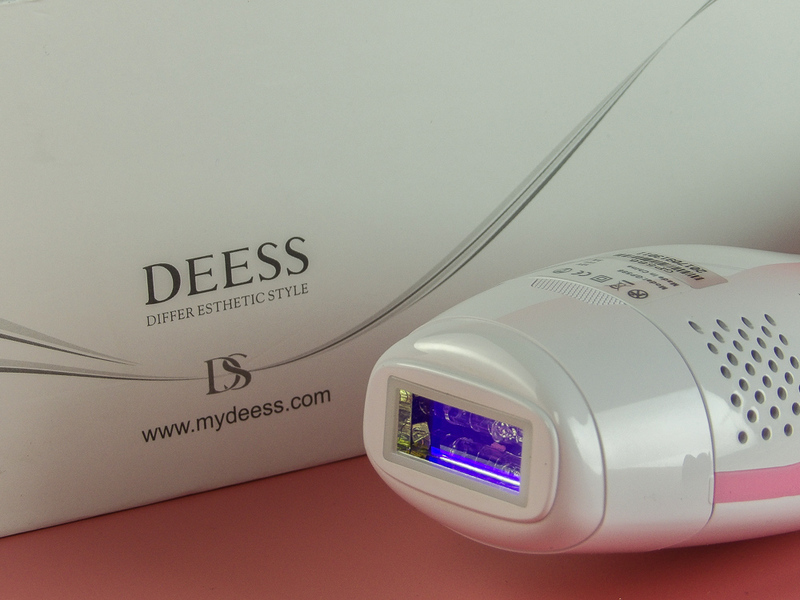 Style Chicks received the DEESS Home RF Skin Rejuvenator in exchange for our unbiased review. However, our experience with the product and the opinions expressed in this review are 100% ours. If you’re reading this, you probably do not need to be convinced that most at-home hair removal methods are a time-consuming hassle. Shaving, waxing, tweezing or whatever method you use to remove unwanted hair can get uneven and short-term results. 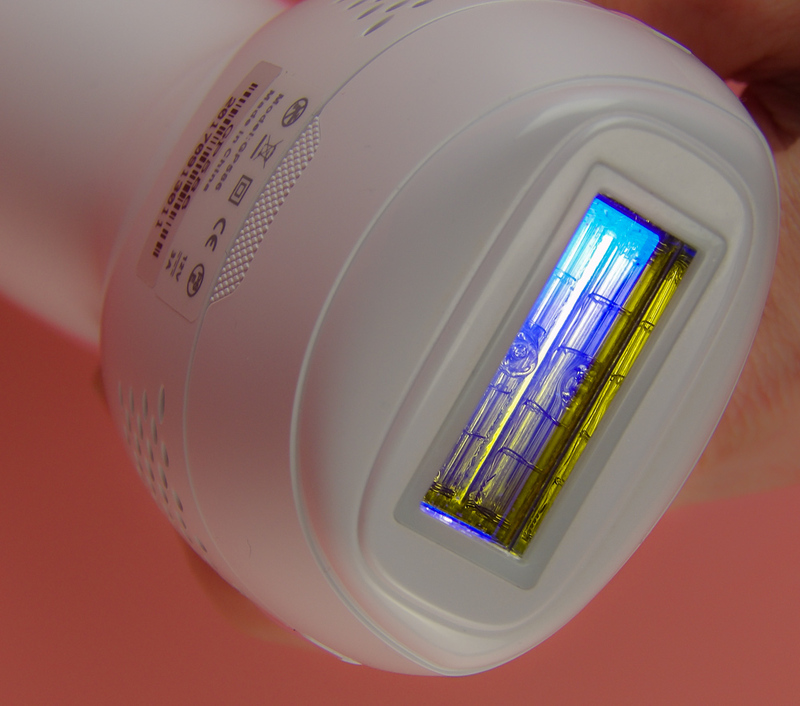 Want a long-lasting, hair removal system? IPL laser treatments for hair removal at the doctor’s office or the spa are effective but expensive and time-consuming. That’s why we love the DEESS iLight3 Home IPL Beauty Device, a home IPL device for Permanent hair removal. 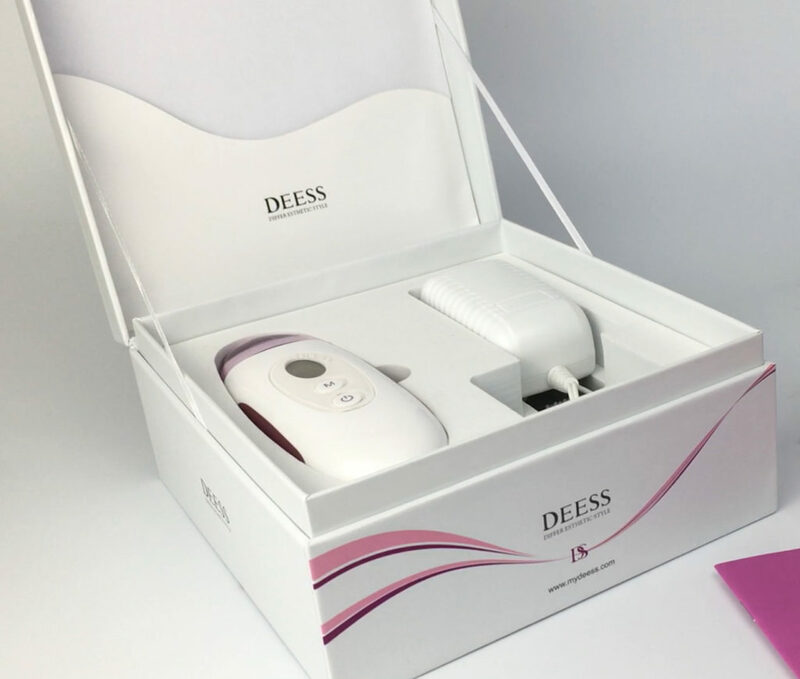 The GSD-approved DEESS iLight device makes at-home hair removal easy! One GSD-approved iLight device, one hair removal attachment, a plug outlet cord, and goggles with full instructions. The IPL uses the energy of short intense pulse light that is absorbed by the pigment within the hair follicle root. After repeated treatments, hair doesn’t grow back. The device can be used for arms, legs, underarms, facial and upper lip hair (except near the eyes). It’s convenient to do at home and simple to use. Shave the area before treatment. When you’re ready to begin, put on the light-shielding goggles and plug in the device. A red light will blink when its’ ready. Hold the button for three seconds to start, you will see blinking lights. Adjust the level as necessary, we’ll begin with default level one. Hold the device vertically on the skin, so that the light emitting window is positioned directly above the section to be treated. Once any redness subsides, treat the entire area again, one click per section. If you can tolerate the device without discomfort, you can choose a more powerful setting than the lowest default level. This is especially useful for stubborn areas of unwanted hair. Most areas respond fastest to levels three to five, but lower levels will work fine, it might just take longer for permanent results. Use the device weekly for one month, Then use it twice a week for the next two to three months. Regular use gets results! Use for 10-12 weeks, hair grows thinner after 3-4 treatments. Touch up every 4 to 6 weeks for smooth, hair-free skin on areas such as legs, arms, and underarms. I found it easy to use, and it was not at all painful. By comparison, I had my underarm hair removed at a spa and even with the numbing cream, it did hurt and it took three to four sessions spaced out over a few months to get results. 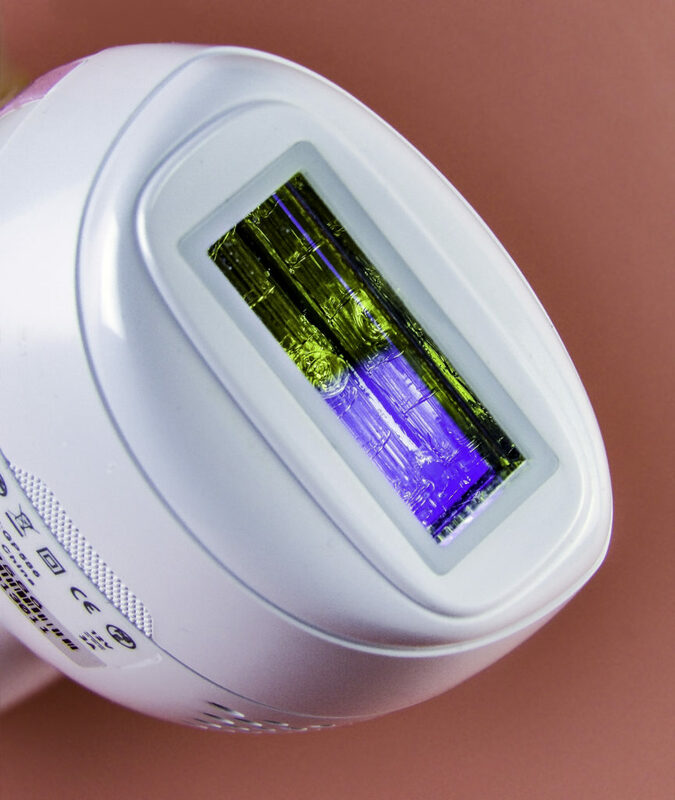 The DEESS iLight3 Home IPL Beauty Device not only didn’t hurt at all even upon more sensitive areas, but the results so far have been quite impressive. It compares very well with the results I got from a professional. 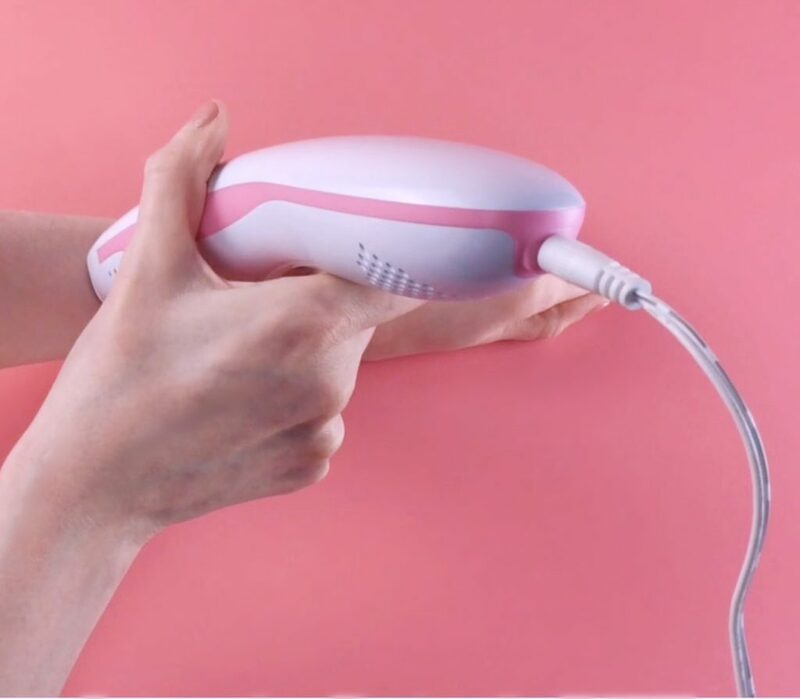 Not only is it easier, faster, more sanitary, more private and more convenient to do the hair removal yourself at home, but it is far more cost-effective. 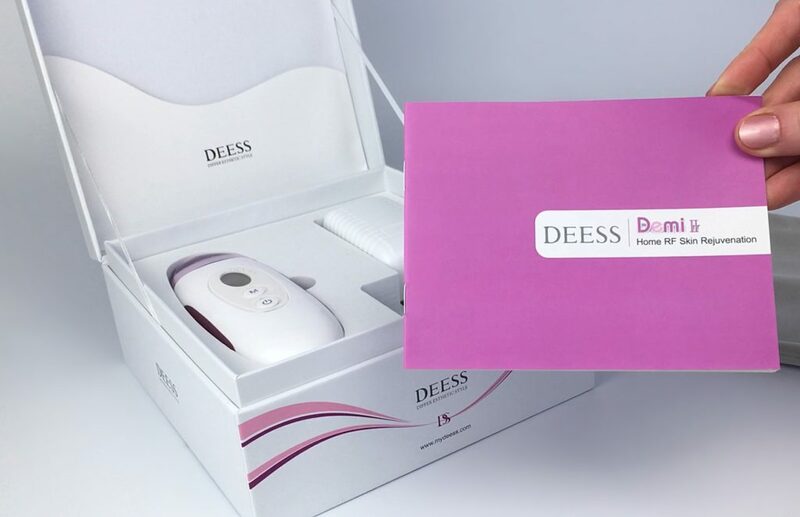 The cost of just my underarm hair removal at a spa cost was almost double what the cost of the entire DEESS iLight3 Home IPL Beauty Device kit! 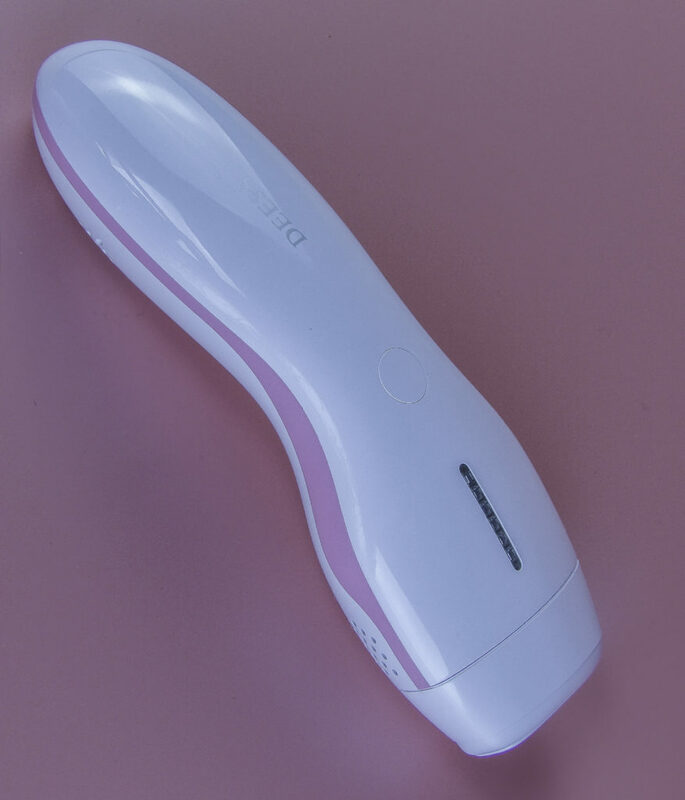 With IPL laser hair removal for legs at a spa costing several hundred dollars and up, I was so pleased to see how quickly and effectively the DEESS iLight3 Home IPL Beauty Device has worked so far on my legs and legs, even stray hairs on toes and fingers. TIP: The IPL light is VERY intense. Always wear the goggles while using the device! Regrowth is getting more and more sparse during the treatment timing, so I love not having to shave my legs as often. I also like that it accomplishes this on the one cartridge, whereas devices like NoNo! required multiple replacement cartridges over a short period of time and they were not nearly as effective. I also like that I can treat all problem hair areas: arms, armpits, legs, and upper lip with one device. 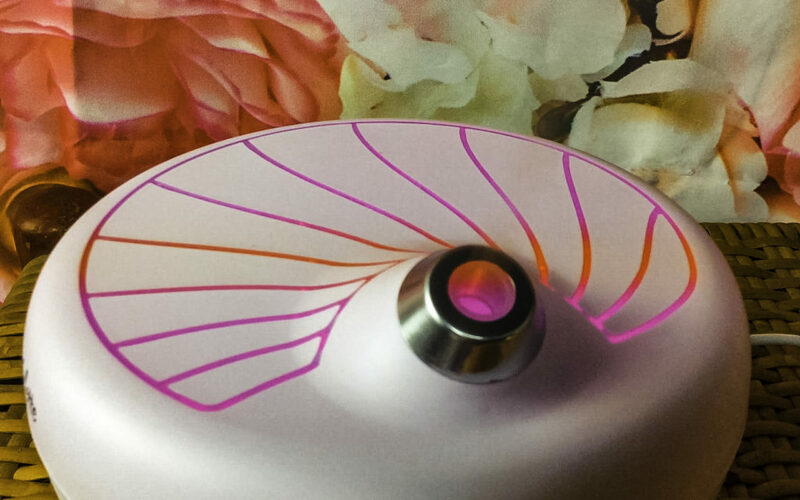 Style Chicks received the DEESS iLight3 Home IPL Beauty Device in exchange for our unbiased review. However, our experience with the product and the opinions expressed in this review are 100% ours. 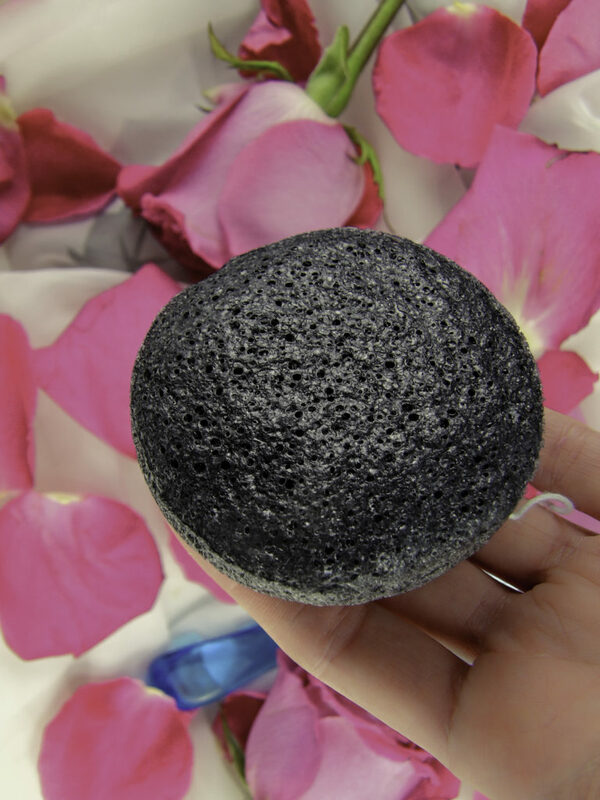 You’ve probably seen the Charcoal Konjac Sponges in Sephora and Ulta and wondered if they would be too abrasive for your problem skin. No matter how problematic your skin is, it can be improved with the proper skin care regimen. The proper choice of cleanser, moisturizer, topical treatments, and sunscreen are all important, but so is the choice of cleansing tools. Washing your face with your bare hands cannot provide enough friction to get skin clean and can transfer bacteria and oil from hands to the face. 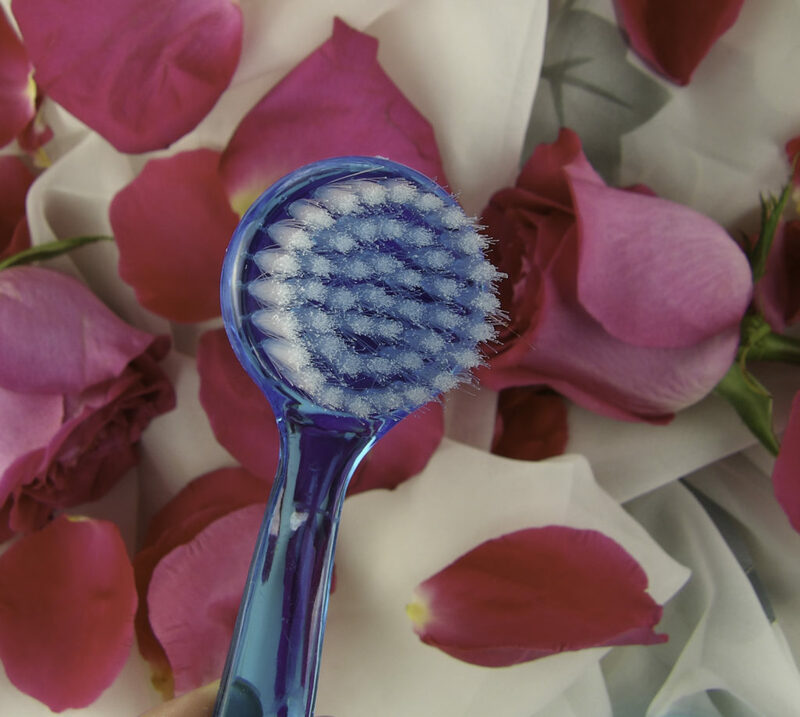 A wash cloth or sonic cleansing brush may be too rough for some skin types, and for others, these tools still do not remove blackheads. We recently tried the Bellesentials Skincare set, a trio consisting of a Charcoal Konjac sponge, a Pore Cleansing Pad and a Facial Cleansing brush that allow for a deep cleanse to remove blackheads without irritating delicate skin tissues. 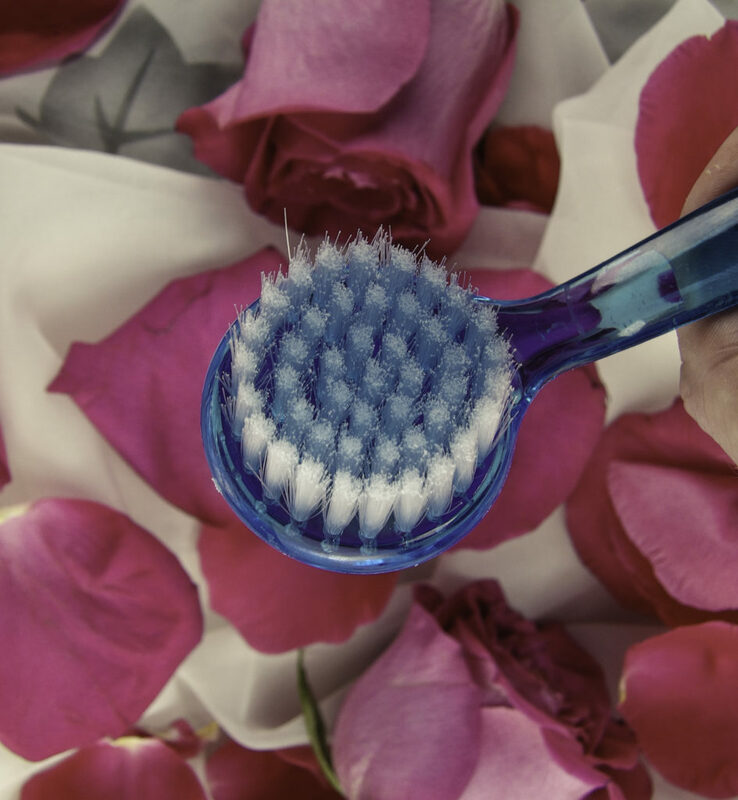 Does your cleansing brush really remove all your makeup and sunscreen at the end of the day? Mineral powders are particularly difficult to remove. How about removing the entirety of a facial mask on a DIY home spa night? Regardless of what goes on your skin, it must be removed before bed so the skin can repair overnight. This cleansing also allows for any evening topical skin care, such as Retinol, to fully absorb into the skin. The skin must be able to breathe at night and residual makeup can easily clog the pores, leading to congested skin and breakouts. This is a three piece set in a clear, compact, zippered travel case bag. 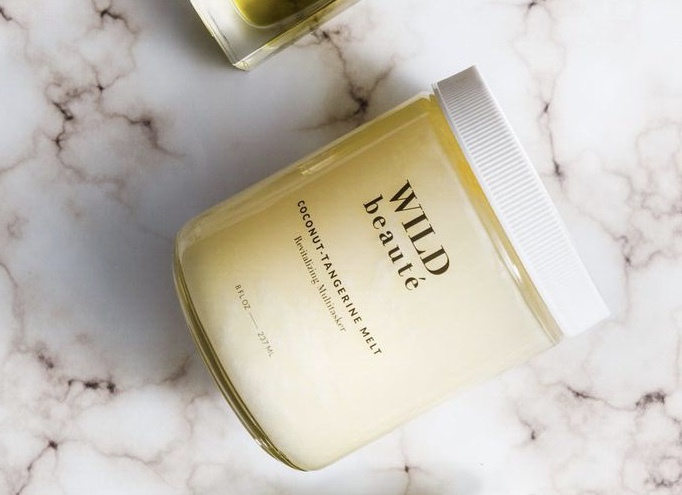 It makes simple work out of removing makeup, sunscreen, or beauty masques resulting in a smooth, clean surface to apply topical skin care products, as well as removing dead skin cells and blackheads. 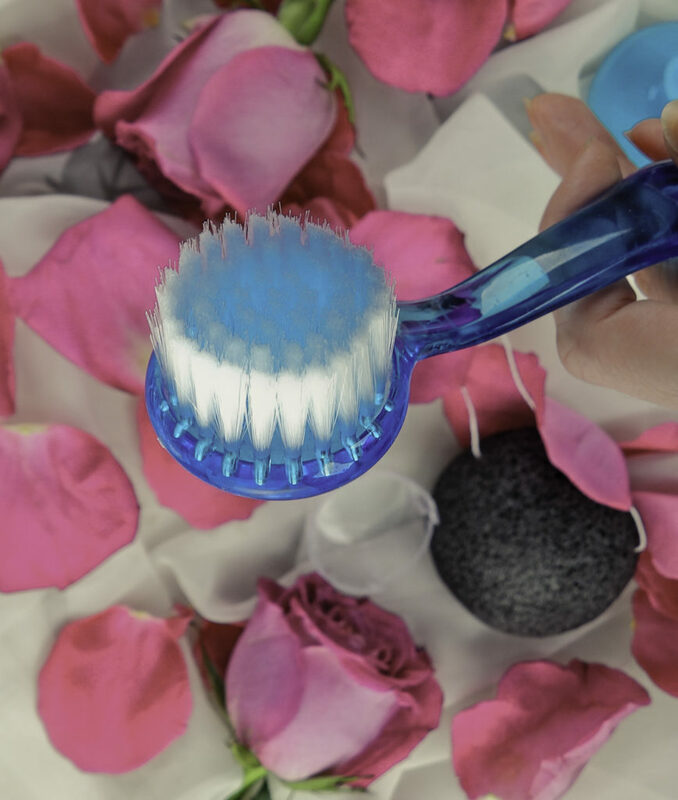 This brush is for the removal of makeup, sunscreen, environmental dirt, and grime, as well as DIY beauty masks. 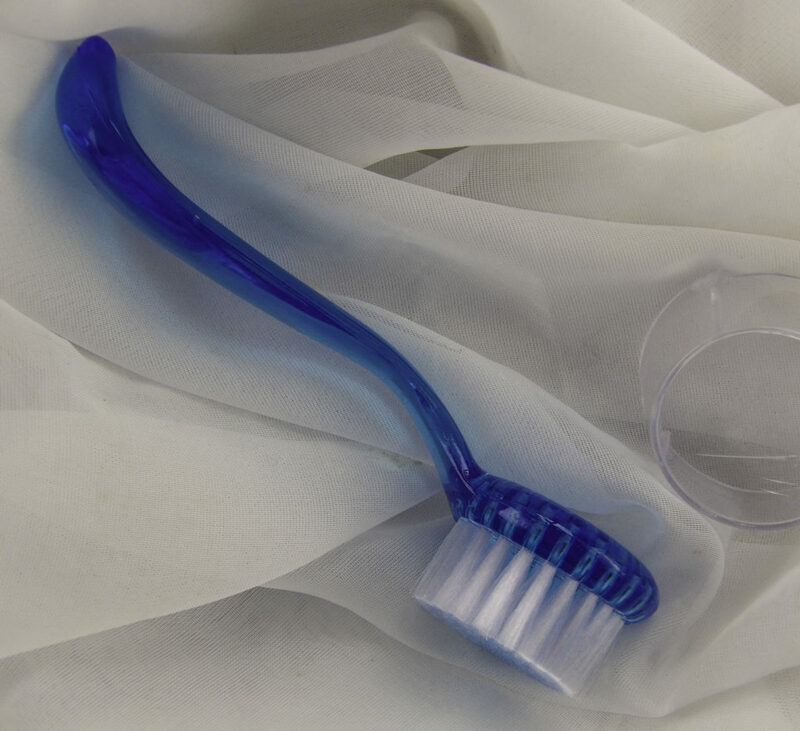 It has a soft bristle head with an easy to grip handle. I like the idea of a small soft brush so that I do not transfer germs or bacteria from my hands onto my face during and after cleansing. It works up a good lather and whisks away surface dirt and oils, even oil based makeup. 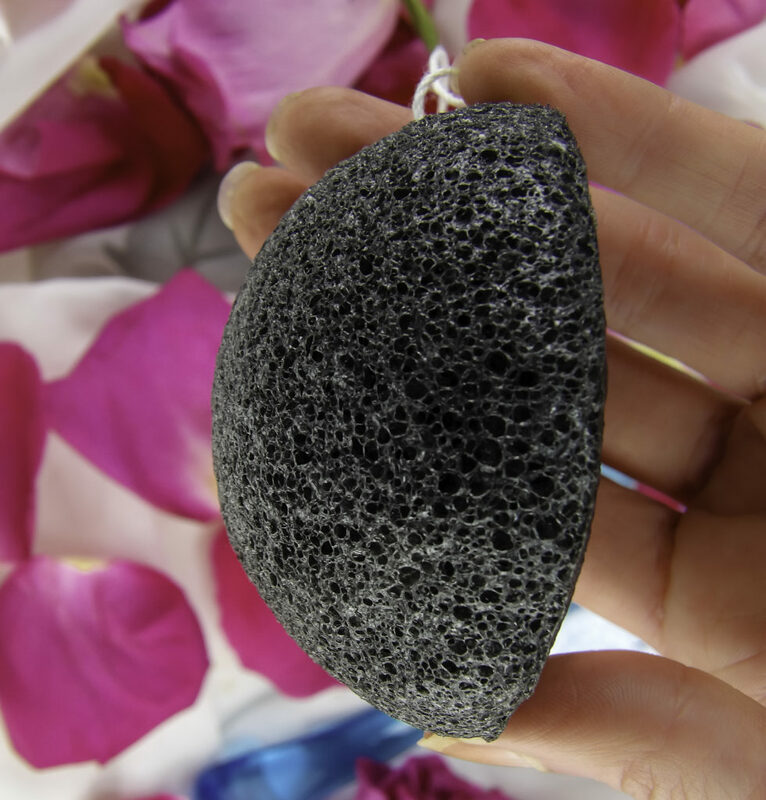 You may have seen Konjac Sponges in stores like Sephora and wonder if they are too harsh for the skin, especially those with charcoal. 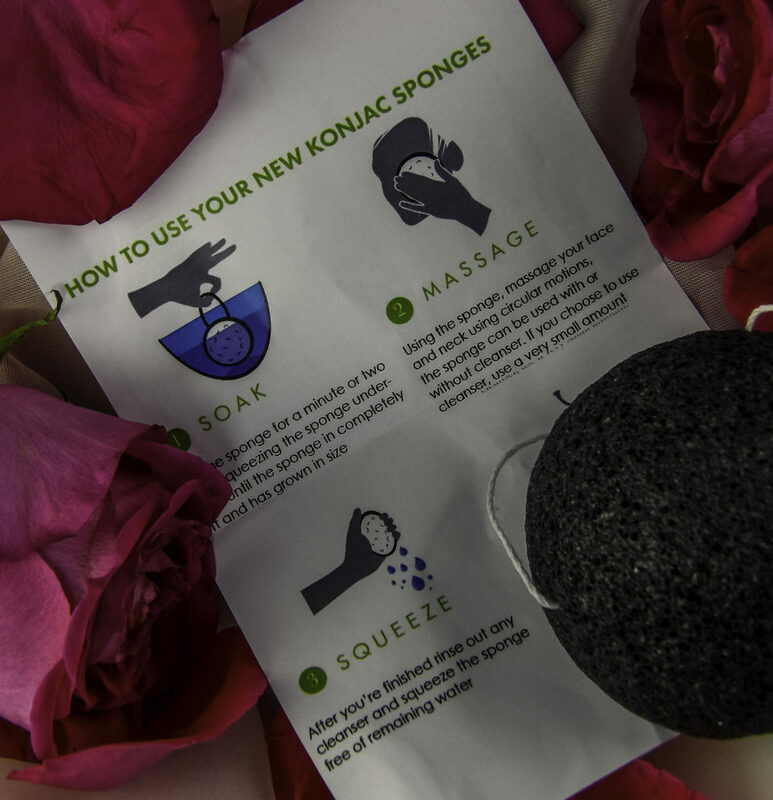 Despite its’ hard, almost loofah like appearance, once Konjac sponges are wet, it becomes super soft and is even more gentle than a washcloth or sonic cleansing brush. 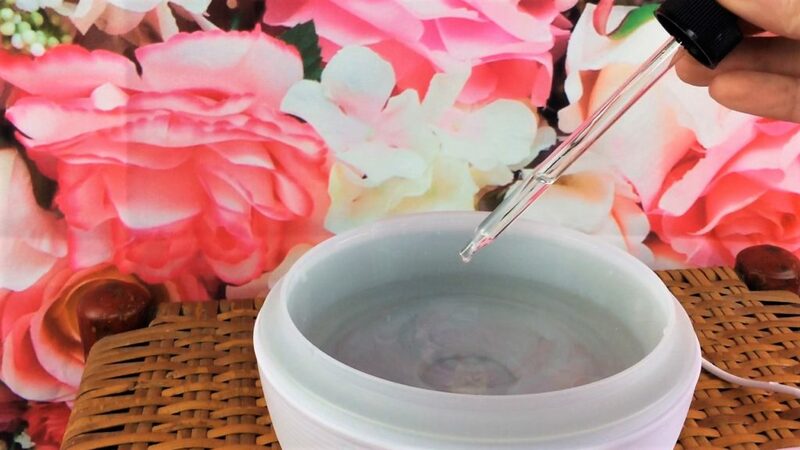 The sponge is made of the Konjac plant which is a fibrous root that is a natural exfoliant for combination or oily skin, or for use on the oily areas of normal skin, such as the nose and chin. 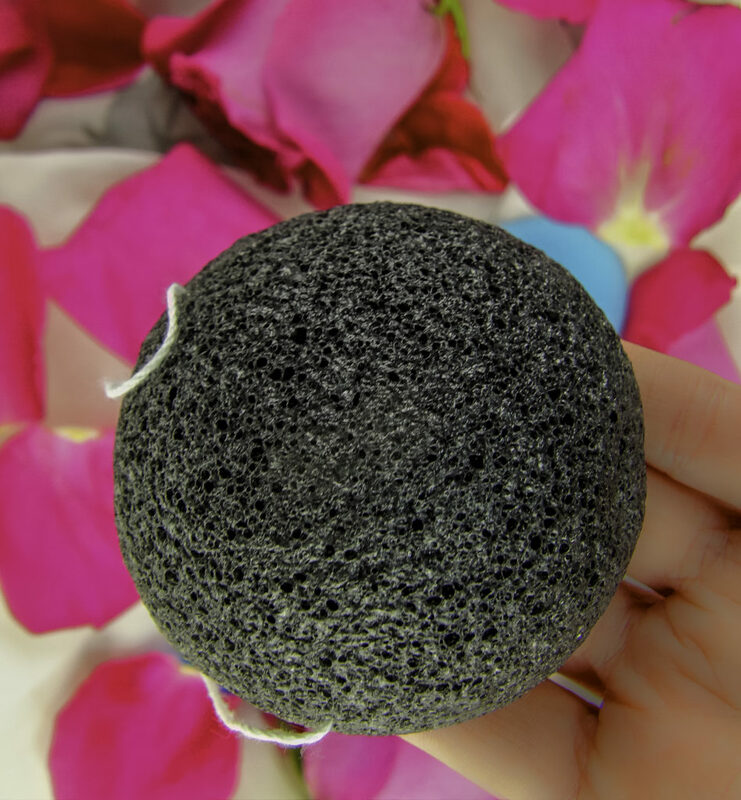 The sponge is also enriched with charcoal that has clarifying properties. 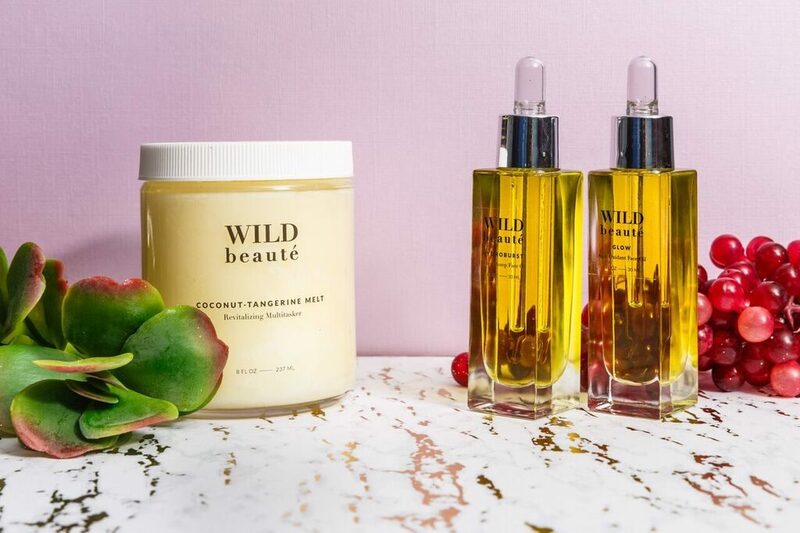 The objective of this combination is to gently buff away dry skin, excess oil, sebum, and bacteria, without disrupting the good oils that promote the proper pH balance of the skin or causing irritation to the delicate skin. It reduces the appearance of pores and reduces acne without provoking other sensitive skin conditions such as rosacea or eczema. This sponge is very helpful for cleansing acne, as it is not abrasive yet still exfoliates away dead skin, allowing acne medications to penetrate. It also helps reduce acne by removing dead skin cells that can clog pores and trap bacteria and oil. 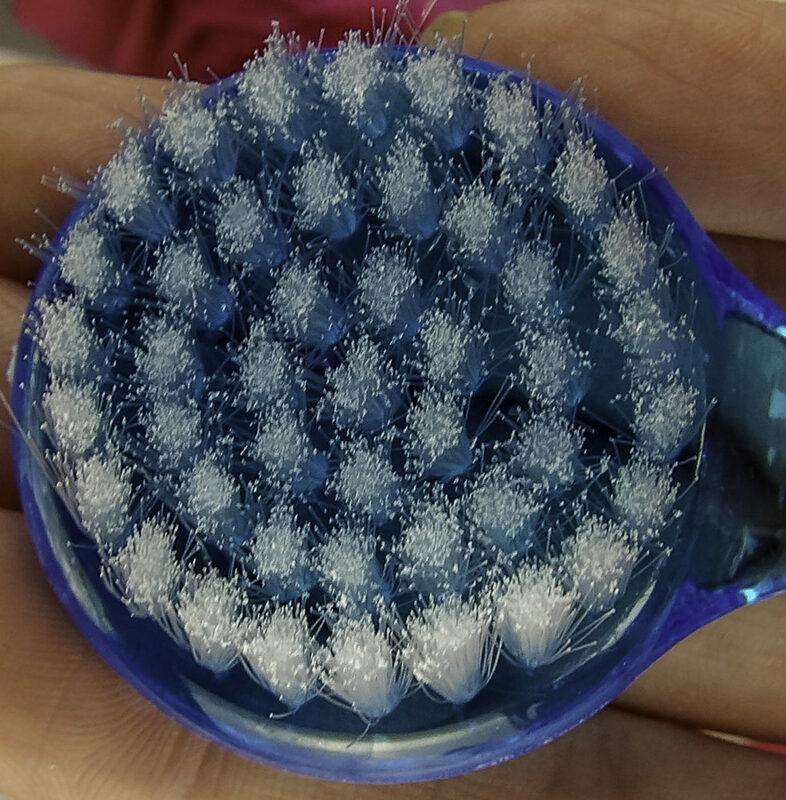 To use, rinse the Sponge with warm water before each use. Apply cleanser and massage in a gentle, light, circular motion. Rinse thoroughly after use. Use daily, or if well-tolerated, twice a day. 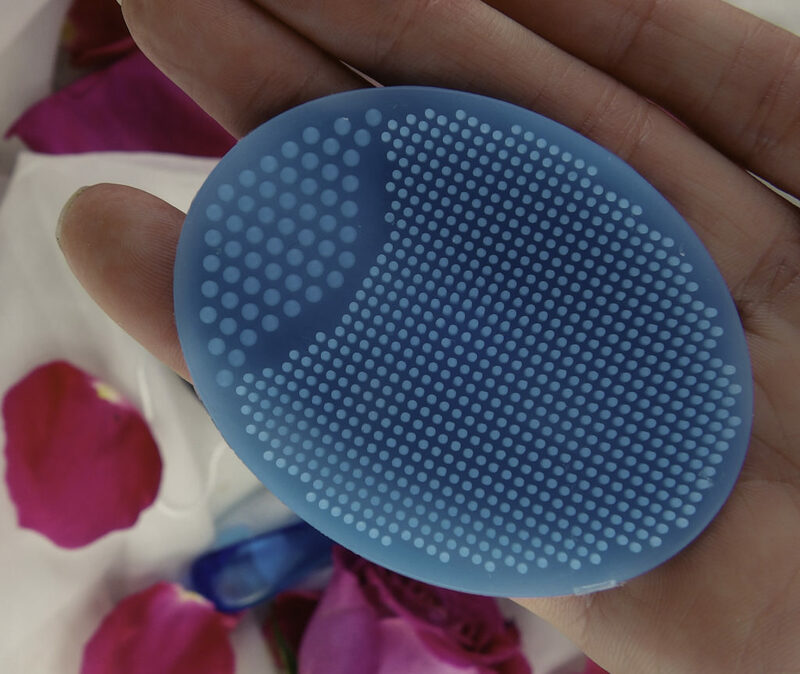 It’s not necessary or even helpful to scrub your face with this sponge, just a brief once over done with a gentle circular movement on a wet face or with your favorite gentle cleanser will do. It can be used on both the face and neck. To care for the sponge, rinse thoroughly after each use, squeeze out the excess water and allow it to air dry. Do not wring. This Bellesentials Three Piece Set also includes a pore cleanser pad that deep cleans the pores and reduces their appearance. 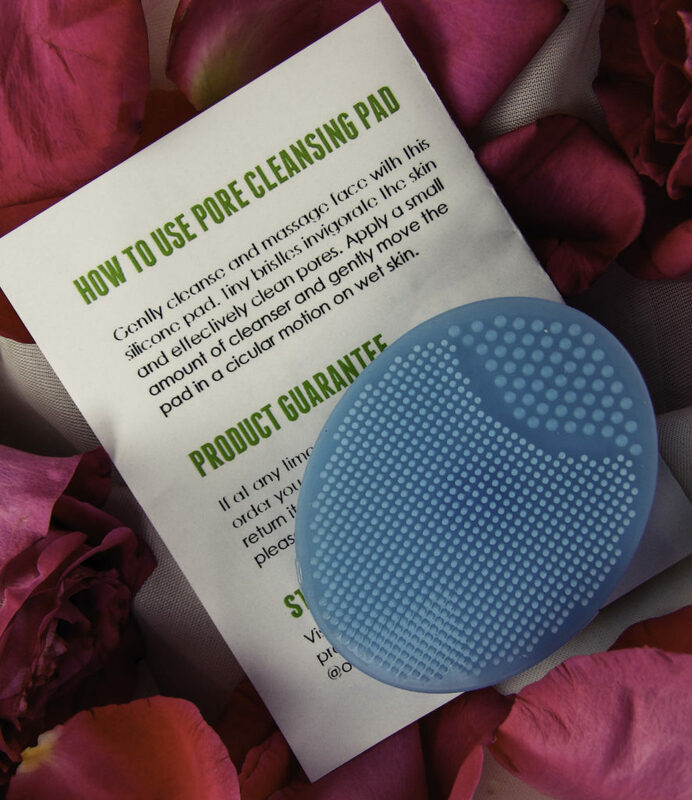 The surface has flexible knobs to gently provide enough friction to pull dirt out and cleanse pores without damaging the surrounding skin the way a washcloth can. 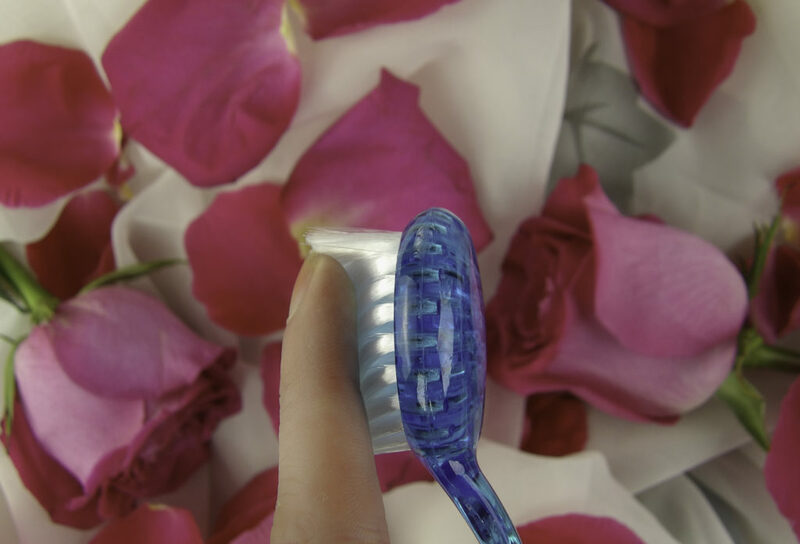 The back grip makes it easy to use and apply it just where you want to deep clean and avoid the delicate skin. Easier to pack for travel, for use at the gym, or just to stow away conveniently in your bath. 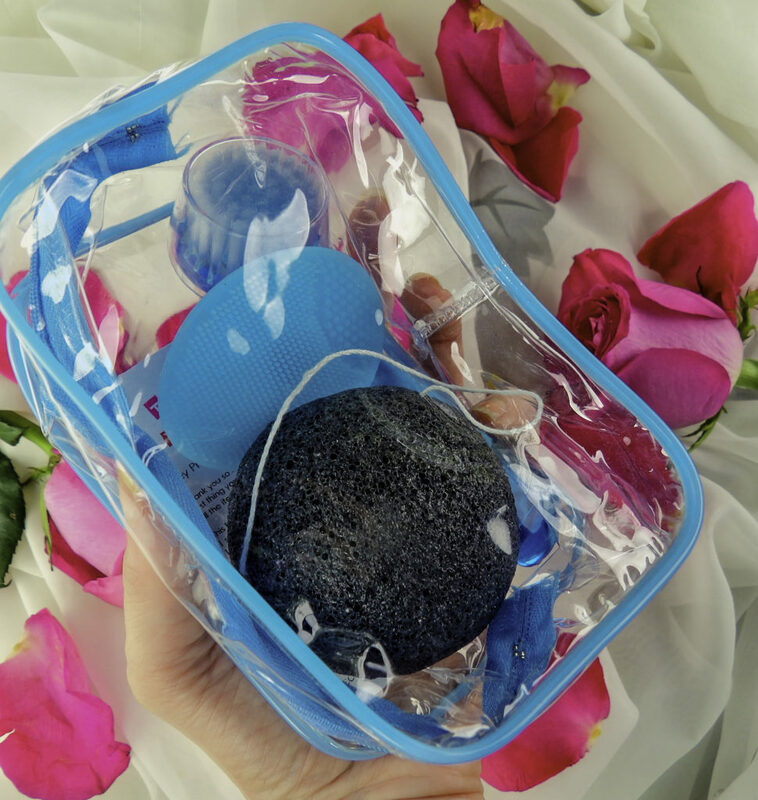 This Bellesentials Charcoal Konjac Sponge, Pore Cleansing Pad and Facial Cleansing Brush Three Piece Set is an excellent value, as charcoal enriched Konjac sponges alone cost upwards of $15. If you have acne, eczema, rosacea or just skin that is generally sensitive, it is often difficult to properly and thoroughly cleanse the skin without irritating it. Yet to keep skin clear and to allow topical products to work their best, the skin must be clean. This kit provides three excellent cleansing tools that address common skin care cleansing concerns without using harsh abrasives, chemicals or rough washcloths. Style Chicks received the Bellesentials Charcoal Konjac Sponge, Pore Cleansing Pad and Facial Cleansing Brush Three Piece Set in exchange for our unbiased review and received compensation for our time and effort. However, our experience with the product and the opinions expressed in this review are 100% ours. Do you like Aromatherapy to enhance your mental clarity, improve sleep quality, or energize you for a yoga session or home workout? Like to have a travel diffuser with all the power of a larger device? 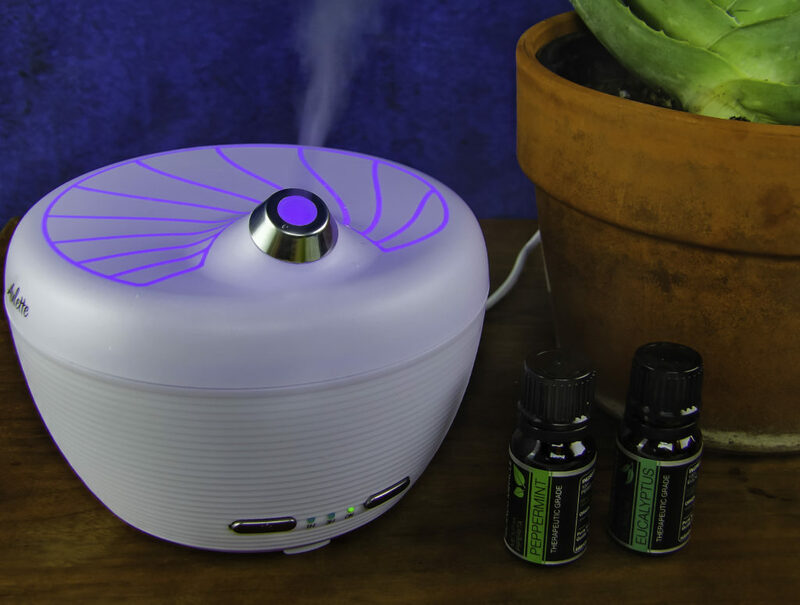 The Aulette Home Essential Oil Aroma Diffuser silently dispenses a cool hydrating mist while gently dispersing relaxing, energizing or therapeutic aromatherapy oils into the air. It also serves as an air purifier. But don’t let the compact size fool you, it holds enough water for ten hours of consecutive use: ideal for overnight or during an entire workday or for traveling. 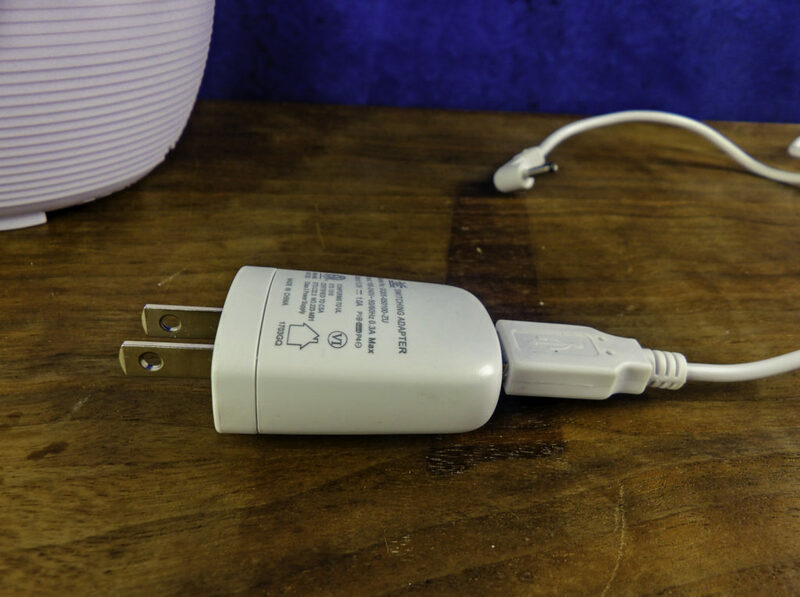 BONUS: The USB port option allows for diffuser use without a direct electric plug option, meaning it can be used plugged into a laptop working off the battery. 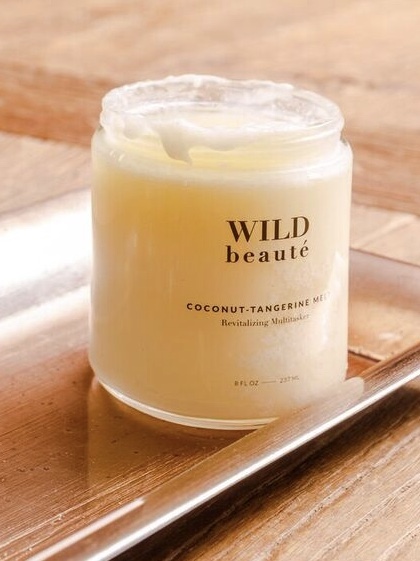 OVERVIEW: You know that Shakespeare’s Midsummer Night’s Dream quote, “Though she be but little, she is fierce!” That’s sums up the Aulette Diffuser pretty well. The size is compact but it has the output of a full-size diffuser. I also really appreciate the no leak, silicone seal design, it’s ideal for placing on a nightstand in a dry bedroom or on an office desk. 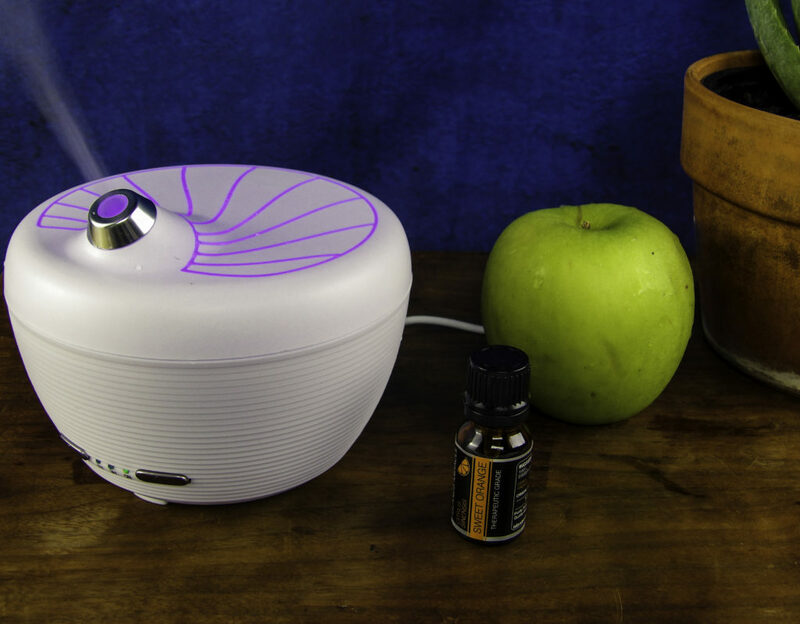 The compact size of the Aulette Home Essential Oil Aroma Diffuser: taller than a green apple, shorter than a 12-ounce can. Choose continuous misting, the 1 hour or 3-hour timer. Perfectly safe for overnight use because it has an automatic shut-off if it runs out of water. 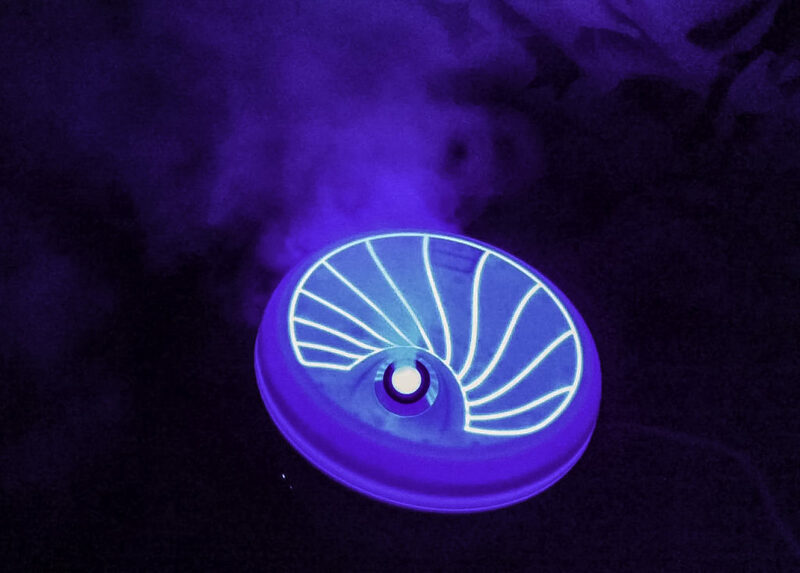 The misting and light features work independently. Light and Mist options. Choose one-hour, three-hour or the default setting of continuous mist with auto shut off. Powered by wall socket or USB-port, it can even run on an office desktop. The colored light feature is a design along the top face of the diffuser, providing upwards illumination. It is a small unit, perfect for smaller spaces, but it still runs for up to ten hours. The top and fittings are far more sturdy than I have seen on many diffusers, resisting leaking while moving, refilling, or adding essential oils. Of note, the USB plug option of the Aulette Diffuser works even if your laptop is running off the battery and not plugged directly into a wall outlet. This is ideal for using the Aulette Diffuser while working or studying in a place without electrical outlets, or even during a power outage or in the car or a stale smelling camper or camping tent. 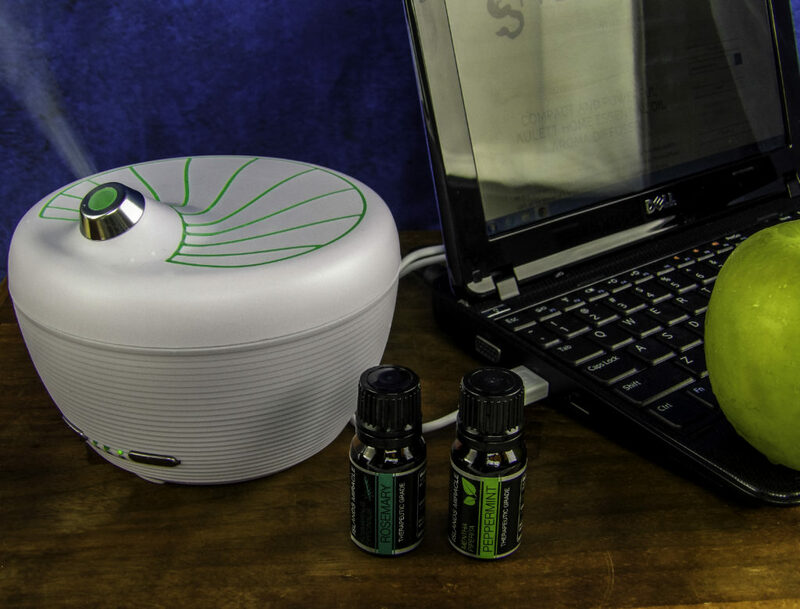 The Aulette Home Essential Oil Aroma Diffuser plugged into a mini laptop via the USB port means you can even enjoy aromatherapy on the go! Set the LED color to match your decor or mood or allow it to continuously run the color cycle. Watch the relaxing full-color cycle display as it soothingly shifts from red, yellow, orange, pink, purple, green, and blue. The light is colorful but not distractingly bright or flashy, it’s a soothing that illuminates upward. The set up is intuitive, plug it in via USB or tradition plug port, I like the dual design of the plug. Fill with water, add essential oil if desired. Choose your light and timer settings. Remove the secure silicone top, add water to the fill line and then add a few drops of the essential oil of your choice. See some ideas below. Do you wake up with a sore, scratchy throat, dry mouth or irritated sinuses, even when you are not sick or have allergies? Your bedroom may be especially dry. 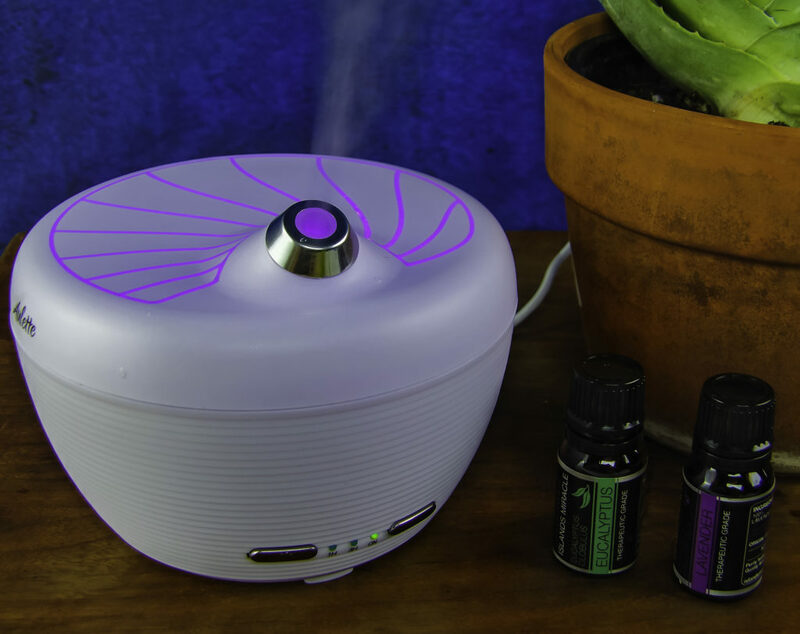 An essential oil diffuser is very helpful in getting a good nights sleep, especially if your home has forced heat or central air, as these can evaporate the natural moisture in the air, making it more difficult to breathe. 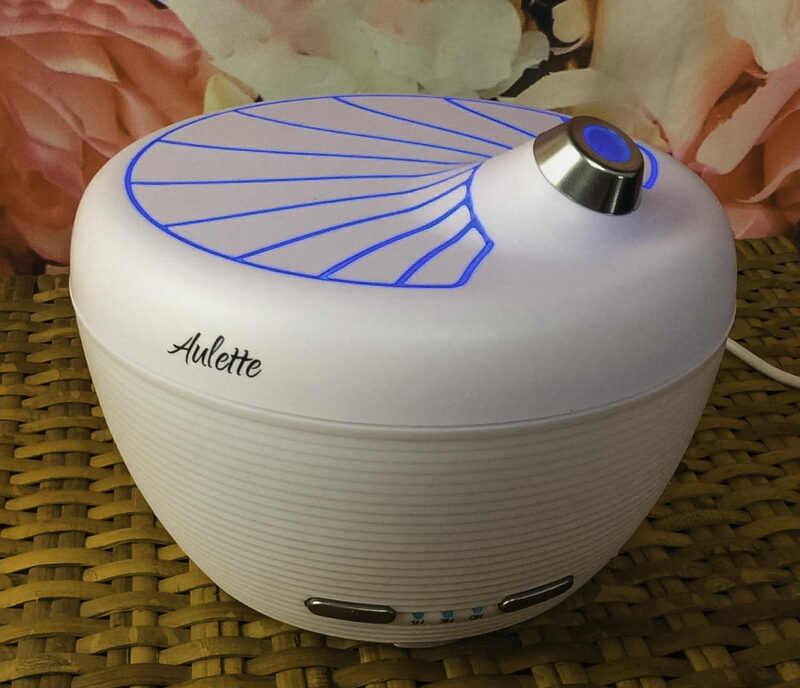 If you or a sleeping mate tends to snore when congested, the Aulette Home Essential Oil Aroma Diffuser can help, because it runs completely silent, it makes so little noise, if I didn’t see the mist, I wouldn’t know it was actually on. For a better night’s rest when congested due to allergies or illness, diffusing Eucalyptus Oil can work wonders. Has someone been sick in the home? Tea Tree Oil helps naturally cleanse the air and nearby surfaces of remaining germs and bacteria. The light is not so bright so as to keep you awake, but provides some light, but not as bright as a nightlight. I like the glowing colors and find the orangey-amber particularly soothing. Sleep soundly and comfortably with the glow of a nondisruptive, soothing light, plus your favorite relaxing essential oils such as lavender or sweet orange to promote good sleep. I find that the cool mist hydrating the air makes it much easier to breathe and sleep. Ideal for improving concentration at work or while doing homework or paperwork, I like to use Rosemary essential oil to enhance mental clarity. Peppermint Oil can energize and improve the mood. 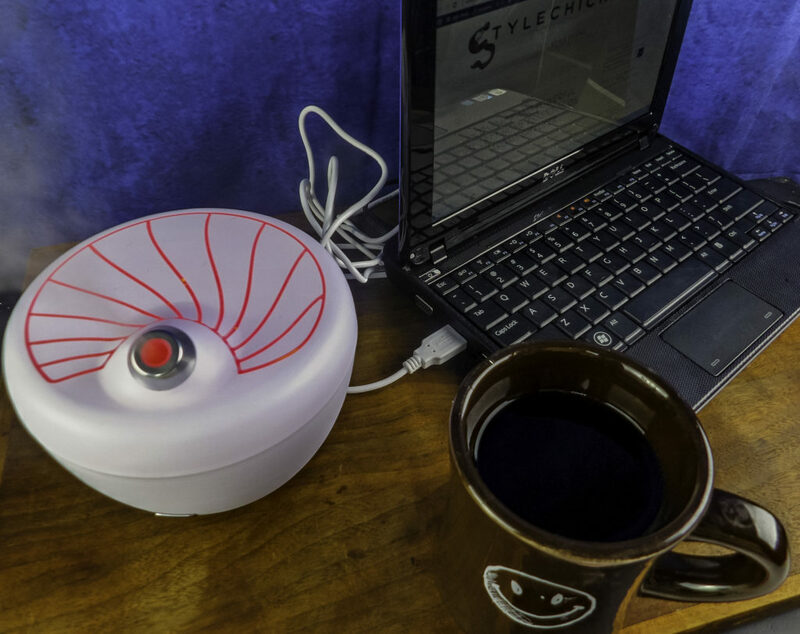 The Aulette Home Essential Oil Aroma Diffuser USB port works well on a desktop with a computer or laptop if you are short on plug outlets in a desk area. Diffuse Rosemary for clarity and concentration or Peppermint for endurance, alertness, and energy while studying or working. 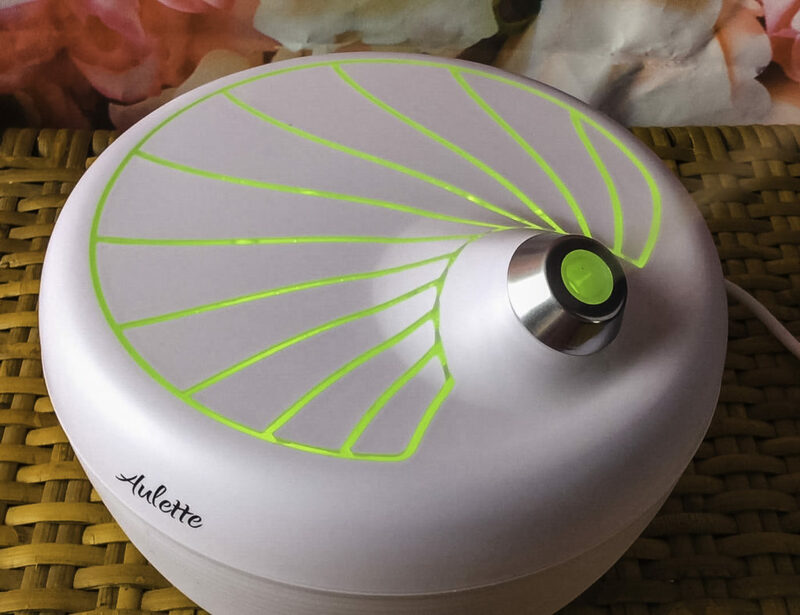 Using the Aulette Home Essential Oil Aroma Diffuser during a pilates or yoga session or even while using my treadmill or stationary bike can help invigorate or provide a relaxing environment for concentrating on a good stretch. I find the proper aromatherapy is as helpful as the music playlist I select for getting into the right mindset to exercise. Don’t feel like working out? Diffuse some Peppermint to improve the mood and energize yourself. Eucalyptus is great for cardio, as it makes it easier to take deep breaths and feel awake and alert. Lemon is a mood enhancer. 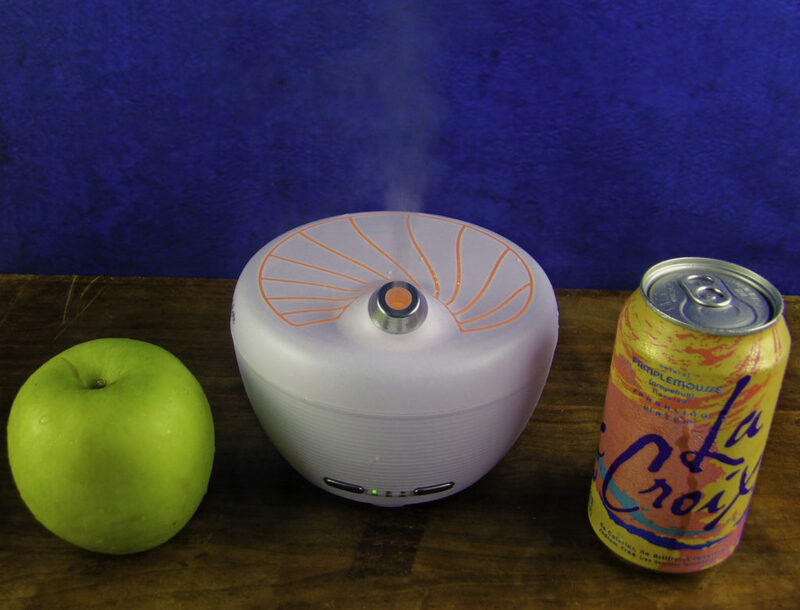 Citrus scents such as Sweet Orange Essential Oil helps dissipate strong food odors after cooking without the use of artificially scented chemical aerosol sprays. Lemon is a universally liked scent that makes a home seem more inviting, cleaner and happy. 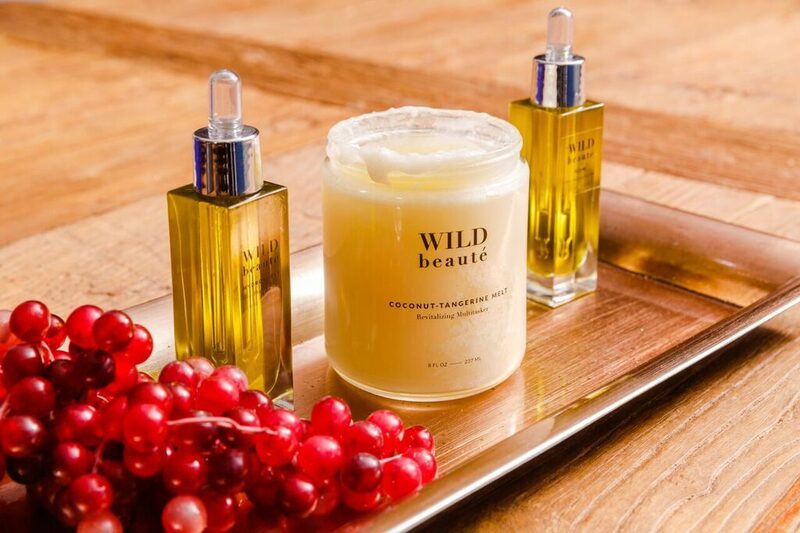 Cinnamon and apple are also considered inviting scents if you are expecting guests and want to diffuse a scent after cooking but before dinner guests arrive. 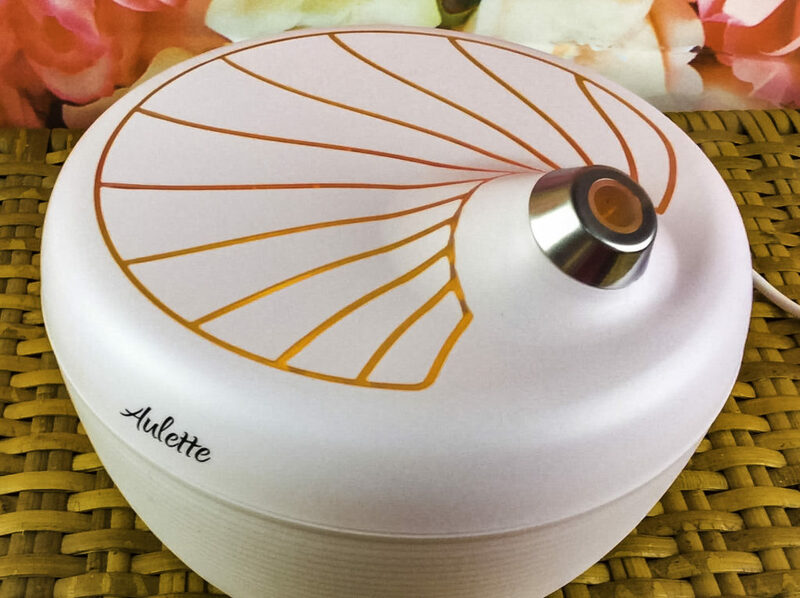 The Aulette Home Essential Oil Aroma Diffuser is compact enough to pack for traveling and use in a hotel, it also can be used while camping when plugged into a laptop via the USB port. I like to be able to diffuse some essential oils in a hotel room to cleanse the air and add some moisture to the air. It is also nice to have some light to help orient me when I wake up in an unfamiliar place. To fight stress and promote relaxation: Ylang Ylang, Bergamot, Lavender, and Roman Chamomile. While studying for exams: Rosemary, Peppermint, Eucalyptus, Ylang-ylang. Sandalwood, Lavender, Citrus, and Sage. 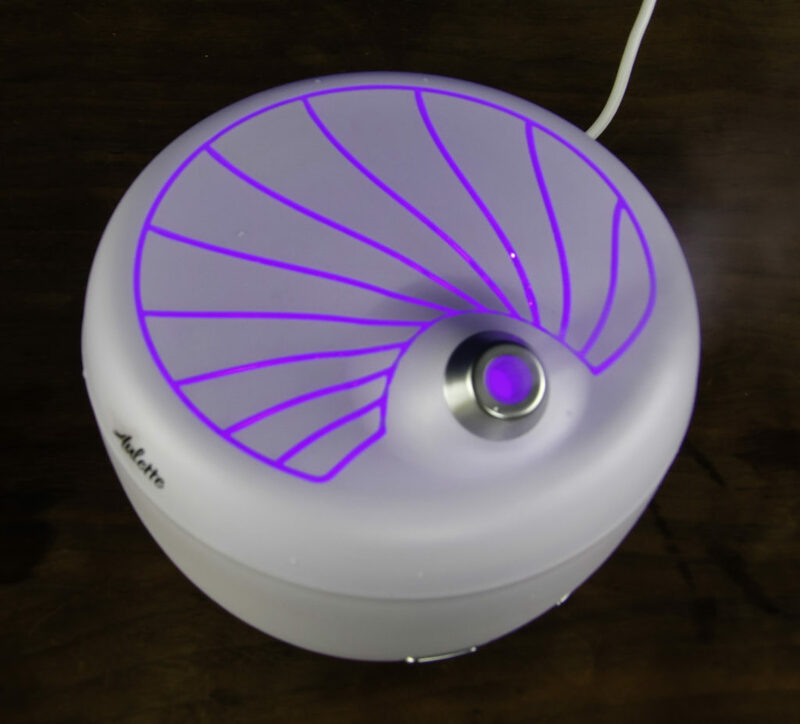 The Home Essential Oil Aroma Diffuser is very useful and efficient for home and office use, it’s compact yet runs for ten hours so it can be used overnight. The optional colored LED light provides a pretty glow, especially soothing at night. The sturdy silicone seal construction prevents leaks and makes it easy to refill, which makes it ideal for use on a computer desk. 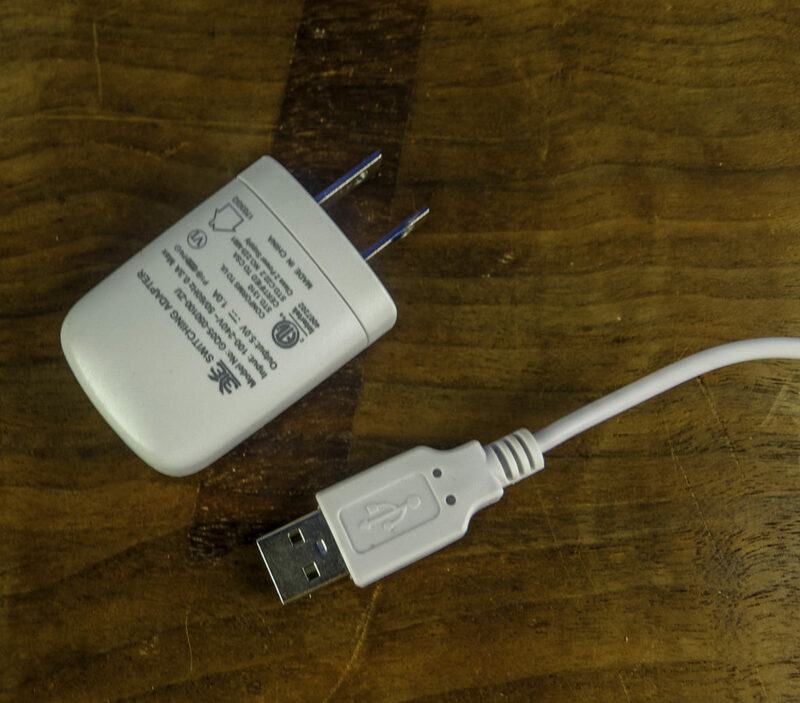 The USB enabled plug is very useful on a small computer desk when you are short on plugs. 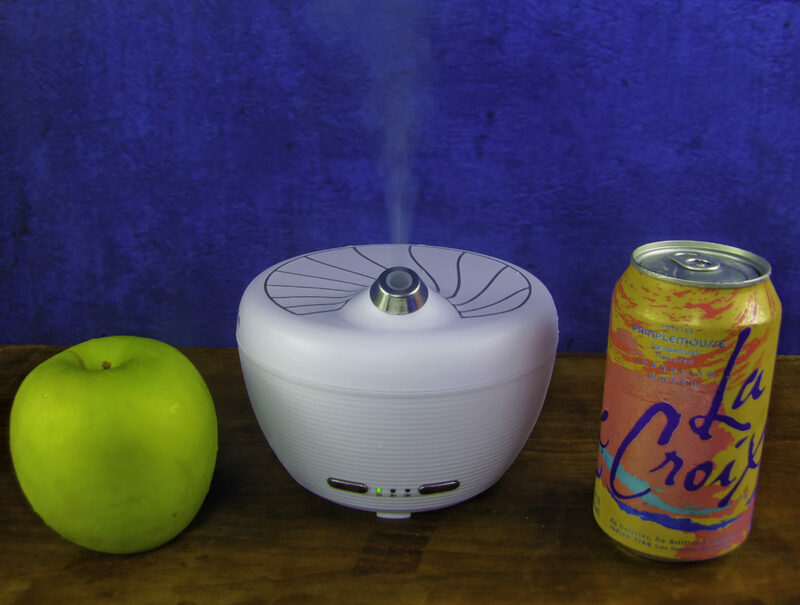 It is compact enough to use while traveling, yet powerful enough to counteract the dry, stale air of a hotel room. Style Chicks received the Aulette Home Essential Oil Aroma Diffuser in exchange for our unbiased review and received compensation for our time and effort. However, our experience with the product and the opinions expressed in this review are 100% ours.